An infinite amount of realities means there are always more possibilities for your Storm Knights to harness! 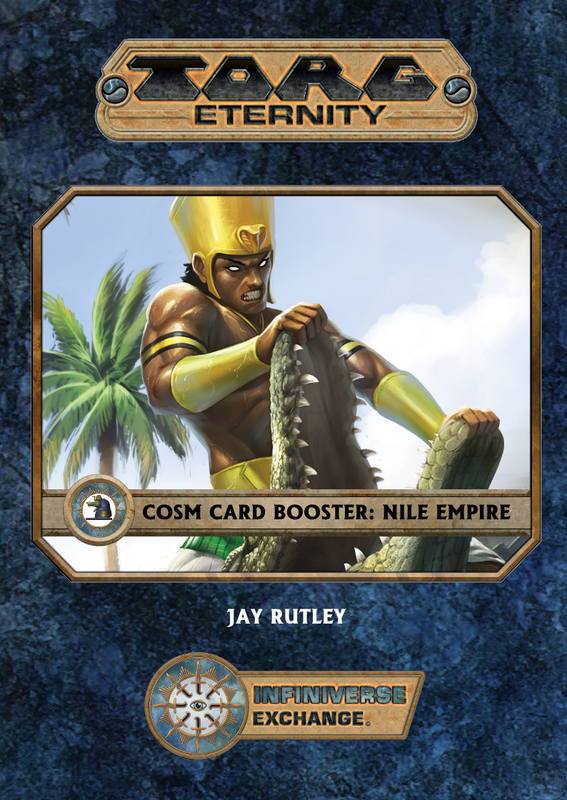 Add 10 new Cosm Cards for use in the Nile Empire in Torg Eternity! New cards such as KA-BOOM!! or By the Power of Ra! will allow your players to perform additional feats of danger and daring during the dramatic combats the Nile Empire is known for, while cards such as War Weary and Sandstorm emphasize the dangers inherent in this alien reality and the effects of the ongoing horrible war. Also included are different play-style suggestions on how to incorporate these Cosm Cards into your campaign as well as detailed descriptions and GM tips on how to adjudicate each card. Individual cards are detailed in the pdf with tips on using it and well as in a compressed PNG file for printing or incorporating into a virtual tabletop environment. Also included is an additional bonus Suddenly... card so you can have multiples in your deck. I really like the Power of Ra card. It makes sense with such a high Spirit axiom.